As soon as I step off the plane it hits me like a slap in the face. The heat. Warm and thick with humidity. You’d pay good money for a blast of it back home in winter. But here it’s everywhere and, as a result, a spectacular tropical storm ignites the sky as soon as I walk out of the airport. This is of course, the true outback of Australia. 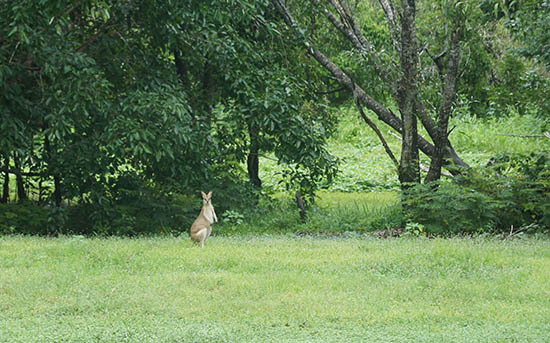 In Sydney, the only place you’re going to see a kangaroo is at Taronga Zoo, but in Darwin, I spot a multitude of wallabies (the kangaroo’s cuter and smaller cousin), every metre or so down the highway. While Darwin does have its share of attractions, it’s outside the city that the outback truly shines. A leisurely (and thankfully air-conditioned) three hour drive south of the city and I’m in the iconic Katherine region, home to the spectacular Katherine Gorge, Mataranka Thermal Pools and miles and miles of stunning and silent outback. 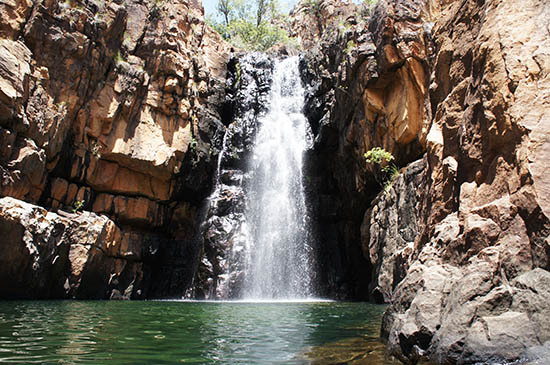 The hiking in Katherine is celebrated but it’s the Katherine Gorge that is the true star. To make the most of it, I head to Nitmiluk National Park, where there is accommodation to suit all; from camping sites to 'glamping cabins' and caravan parks, to chalets and lodges. The accommodation area is beautifully maintained and includes a large pool and restaurant for those who don't want to self cater. From here I explore the surrounding area on foot to get some beautiful views of the gorge and river from atop the escarpment, staying to view the sunset then sit tight in my chalet until the next morning. Bright and early I make my way to join a cruise of the Katherine Gorge. It’s a sunny, beautiful day as we board the boat. Our driver, an Indigenous Australian, offers us local knowledge and folklore as we make our way through the first of three gorges which are accessible by boat. Sheer limestone cliffs, native flora and occasional rapids are just some of the sights as our boat winds its way through the twists and turns. There’s nothing like raw and rugged nature to put your ego in check and make you feel oh-so very small. The landscape is breathtaking, painted naturally in myriad browns, reds and greys. Waterfalls cascade every now and then, and we even spot a freshwater crocodile shading itself in the heat. This is the true outback indeed. After the cruise, I’m keen for a swim. In the wet season (November to March) saltwater crocodiles may have found their way into this part of the river system, so signs alert you to 'No Swimming' in the water. A short ferry ride down though and you can swim in the crocodile-free Southern Rock Hole. I’m dropped off nearby and instructed to follow a chain up into a rocky ravine, guided by the sound of running water. Navigating through the bush with no pathway in sight is about as intrepid as I think I’ll ever get, but sure enough, after a few minutes of jumping from rock to rock, I found it. A stunning freshwater hole complete with waterfall. It’s so hot that I jump in instantly. The water is perfect and apart from a few tiny fish, there are no creepy crawlies, nor crocodiles, in sight. Just a small number of travellers making the most of this incredible natural wonder. Invigorated by my swim, I hop back in the car and head north-east for two hours until I reach Kakadu National Park. The famed wetlands of the Northern Territory, Kakadu is well and truly Crocodile Dundee land, with signs all around warning you not to swim – no matter how hot it is. It wasn’t until the next morning though, that I spotted my second crocodile. After staying the night at the perfectly-placed Cooinda Lodge, I make my way in the dark of 6am to board the dawn cruise of the Yellow Water Billabong. If you’re not a morning person I can vouch that it is well worth the early rise. Within just minutes of casting off, our guide points out a crocodile. A small, female saltwater croc. Minutes later we spy a very large male croc, swimming into the wetlands, checking that no rival males are in his territory. Did you know? 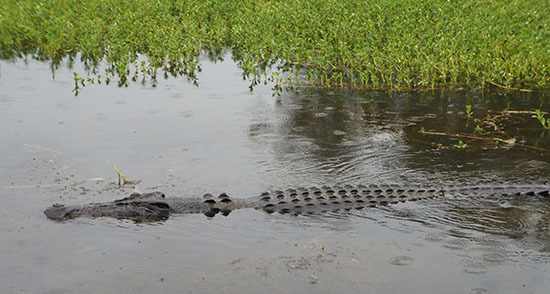 …Saltwater crocodiles are larger and much more dangerous to humans than freshwater crocodiles. Despite the name, saltwater crocs will happily swim in freshwater and can grow up to seven metres. I’m here in March, the wet season for the Northern Territory. In the dry season, the billabong teams with wildlife as buffalo, birds, wild horses and crocodiles congregate on the edges of the much narrower watercourses. 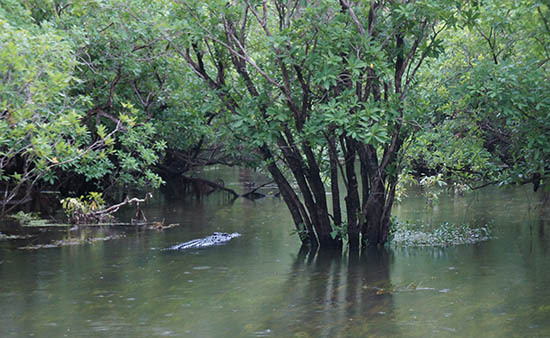 In the wet though, water is plentiful and so wildlife sightings are fewer. Even so, it’s not too long down the river before we run into another large male salty. Our guide tells us the four-metre brute is out patrolling his territory. Showing no fear, he swam right alongside our boat for a heart-stopping few minutes before trailing off. A few more croc sightings later and I think I’ve become addicted. As I drive back to Darwin, my eyes are peeled. I spot a few dingoes, an array of wallabies, even an eagle amazingly drop a fish on the road, before coming to pick it up again. But no crocodiles. Then again, maybe it is for the best. Want to experience the Top End? A tour of Kakadu National Park and a cruise of the Katherine Gorge is included in our Top End National Parks itinerary. Make an appointment to start planning your Northern Territory holiday with an Expert today.